While traveling in Yokohama, Kenshin and his friends encounter a man named Shigure Takimi and a young woman he is protecting, Toki. Years ago, during the revolution, Kenshin fought and killed Toki's older brother, who was also Shigure's best friend. Now Shigure is planning a second revolution to overthrow the Meiji government. Can Kenshin stop him before tragedy repeats itself? Rurouni Kenshin: Ishinshishi no Requiem Poor Kenshin never gets a break. There's always someone out to...kill him. I actually wish I had something nice to say about this one, but there are so many things I hate about this movie. The plot, the animation, the dub! For those three reasons and the fact that this movie doesn't add or detract any details from Rurouni Kenshin, or Rurouni Kenshin: Meiji Kenkaku Romantan - Tsuiokuhen/Samurai X: Trust and Betrayal, I doubt I'll ever bother to watch this again. Last updated Wednesday, January 17 2007. Created Friday, November 17 2006. Rurouni Kenshin: Ishinshishi no Requiem I thought this was an OK movie. I'd certainly watch this movie before I'd watch Seisouhen/Reflections. The only thing that really bothered me about this movie was that Yahiko sounded like he was 15. Last updated Friday, June 15 2007. Created Thursday, May 04 2006. Rurouni Kenshin: Ishinshishi no Requiem I have to agree that the earlier you watch this kenshin experience the better off it will be. Because it is better than some of the other filler episodes, although you will be confused about who Saito is. He shows up in the OVAs and in the Shishio arc of the TV series. The reason you're better off watching this early? BECAUSE THIS MOVIE DOESN'T FIT IN WTIH THE STORYLINE AT ANY TIME!. During the Shishio arc Saito is too busy to mess with small fries like Shigure. Before? He would've wanted to kill Kenshin. After? Kenshin and the rest believe Saito to be dead. But when he shows up in the movie Kenshin doesn't seem surprised. "Oh, hey you." is basically what it looks like. At the very least Sanosuke would've had something to say. The dubbing is terrible. Story is ok, but there are more worthwhile things. In short, true Kenshin fans will be mad as this doesn't live up to it's name, non-Kenshin fans will be lost. Watch this only if you're desperate for some Kenshin fix. Rurouni Kenshin: Ishinshishi no Requiem About like a low end of mediocre episode arc of the tv series. The Kyoto arc was better, but it's still better than that Feng Shui nonsense. If you like the series, watch it, you'll probably enjoy. If you haven't seen Rurouni Kenshin, the movie isn't the best example. The tv show has episodes that are a lot better than this. If you're an OAV fan but don't like the series, stay far away. You won't like this addition. Last updated Wednesday, October 01 2003. Created Thursday, September 11 2003. Rurouni Kenshin: Ishinshishi no Requiem The movie was alright, there was a nice plot to it. But i expected more killing and sword fighting considering its a smaurai movie. And they should have just cut off from calling out there attacks.... Overall the movie was good, somthing i would see again. Last updated Monday, March 10 2003. Created Monday, March 10 2003. Rurouni Kenshin: Ishinshishi no Requiem The movie was good, but it's just not what you would have expected of such a wonderful series as Rurouni Kenshin. The name to begin with, is so wrong! !Why did ADV have to call it Samurai X? (Sames goes for the OAV) Kenshin was NEVER a samurai! He was an assasian. This movie has more to do with the TV series than with the OAV, so the name should have been Ruouni Kenshin the Movie, not Samurai X, the movie. *grumble, grumble* That aside, the storyline was nice, and there were a few comedic moments. I liked the new characters that were introduced. The dubbed voices were awful! Why oh why did ADV have to get the rights to this movie? The voices in the TV series fit their characters much better than the voices in this movie. Overall, it was a good way to spend one and half hours of my time, and every good RK fan should see it. And if you do watch it, you might be better off watching it in Japanese. Last updated Thursday, December 26 2002. Created Thursday, December 26 2002. 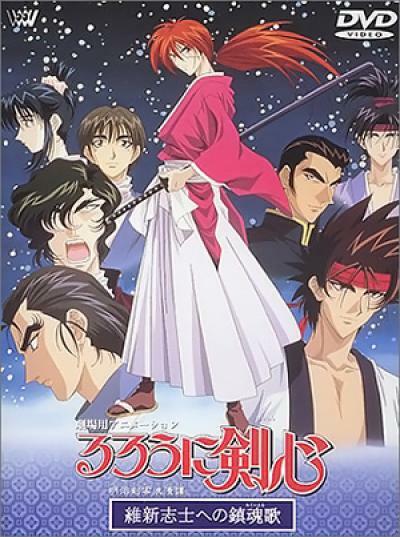 Rurouni Kenshin: Ishinshishi no Requiem The RK TV series is enjoyable. It pushes a serious storyline while maintaining a light-hearted and upbeat attitude yet never manages to feel too silly or cartoony. The characters are wonderfully developed; every major character's background is explained in depth giving the viewer a greater interaction with the character. Even though the OVA is definately more cinematic, the TV series is just more enjoyable. On that, the RK OVA is a cinematic masterpiece. The art is superb, the animation is very fluid, the music is outstanding, and the direction is marvelous. While the character development isn't as strong as that of the TV series, the RK OVA is still a brilliant work unrivaled by any other. With this in mind the RK movie just seems to fall short. It's not that it's a bad movie, it's just not as good as either the TV series or the OVA in any way, however any RK fans owe it to themselves to see the movie at the very least. Last updated Saturday, June 08 2002. Created Saturday, June 08 2002. Rurouni Kenshin: Ishinshishi no Requiem I guess I just found this movie overrated. It looks good sure and the story is quite ok but it doesn't really have "it". I also found the ending fight a little to childish to be taken seriously. Why do they have to shout out everything they are doing? "double dragon fire slash" etc. A quite ok movie after all. The animation is really good at times. Last updated Saturday, March 02 2002. Created Saturday, March 02 2002. Rurouni Kenshin: Ishinshishi no Requiem The Kenshin movie tries to blend the darker aspects of the Samurai X oavs with the more comedic tone of the Kenshin TV series. For me, it didn't really work. To me, Kenshin is not a 'funny' character. He works far better as a tortured, dead serious man, haunted by his past. The whole cartoonish aspect of the TV show, with its bright, happy colors and exaggerated character expressions has always bothered me. The movie seems to shift back and forth, dead serious one minute and cartoony humor the next. For the most part, the atmosphere is serious, utilizing the muted, bleached out color scheme of the OAVs. The brightly colored scenes of the TV cast are jarring, to say the least. The character designs are rather poor, using the same ones from the TV show, which just don't fit the tone. The animation is very good, though, with well done fight scenes. The music is excellent, very restrained and sad, fitting the character's troubled nature. The writing was quite good until the final battle when the characters started screaming the names of their moves, something I have always hated. Still, it was a small price to pay for the decent dialogue of the rest of the film. Overall, I give the Kenshin Movie a buy because of the elements of the OAV that are used. I could have done without the TV show aspects, but oh well. Good story, great character in Kenshin, and nice animation make it a worthwhile purchase. Last updated Tuesday, December 11 2001. Created Tuesday, December 11 2001. Rurouni Kenshin: Ishinshishi no Requiem The Kenshin movie, which I must say has to be watched subbed because all dubs of kenshin are sub par at best, is what you get when you try to combine the ova and the series, they good a good job of it mixing the darker aspects of the ovas and the lighter aspects of the series, however as the saying goes .. jack of all trades master of none, its good at both sides of the spectrum of the ovas and the series however it doesnt have the greatness of either on either side. Last updated Wednesday, September 05 2001. Created Wednesday, September 05 2001. Last updated Monday, July 09 2001. Created Monday, July 09 2001. A very respectable addition to the Kenshin series. However, I'm starting to think that the earlier you watch it in your Kenshin "experience," the better you will like it. I saw it quite early on (around the time I was watching vol. 3 of the TV series and before I saw the OAV's), and I quite liked it then. The later episodes of the Kyoto Arc (volumes 7-14 of the TV series) and the OAV's are indeed more gripping and better-told than this, so if you see them first, the movie will probably suffer by comparison. Still, the movie has much to recommend it. The artwork is sumptuous and the voice-acting is lovely as always. The new characters (particularly Shigure and Toki) are sympathetic. Last updated Sunday, March 03 2002. Created Saturday, April 21 2001.